Bible Cartoons: God speaks at Ffald-y-Brenin! 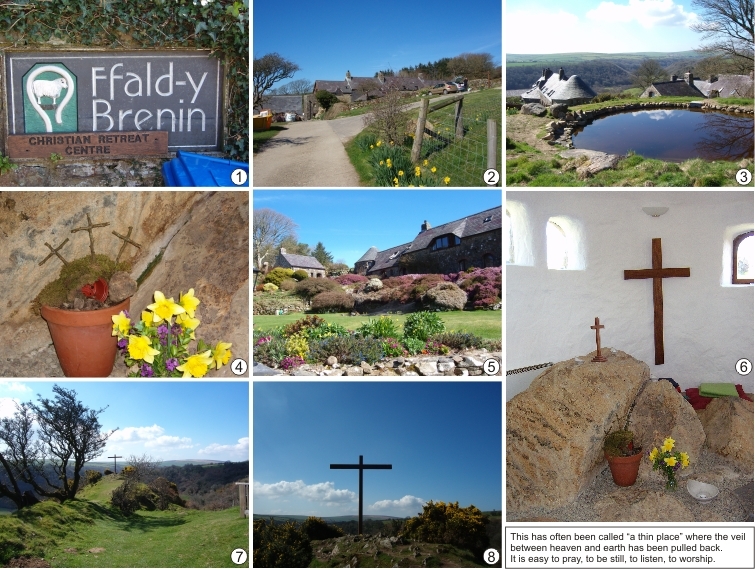 Ffald-y-Brenin Christian Retreat Centre, Pembrokeshire. 7th April 2015. Photo 1 – Driveway sign. It’s quite a hard climb on foot! Photo 2 – Top of driveway, with the little chalets retreat visitors stay in. Note a man packing his car, time to leave for him! Photo 3 – Pond above the centre. Note the conical roof of the famous little chapel in the bottom left of the picture. Photo 4 – In the chapel: daffodils & a little model of Jesus’ empty tomb, made out of moss, flower pots & sticks wired together as three crosses. Photo 5 – The gorgeous heather borders of the retreat centre. Note the conical roof of the chapel in the middle of the picture. Photo 6 – In the chapel: the simple wooden cross, large natural altar stone, small windows & the Easter objects of contemplation (daffodils & empty tomb model). Photo 7 – The famous High Cross, on a high point overlooking the valley below. Photo 8 – The high cross, amidst yellow gorse flowers. We’ve been back to Ffald-y-Brenin the Christian Retreat Centre – WOW, what a day! Here’s the background. My wife & I had a lovely week of holiday over the Easter period in Pembrokeshire, South Wales. We stayed at St. Brides Castle, a beautiful place. We enjoyed the quiet, coastal path walks, & unexpected glorious sunshine. On Tuesday 7th April we drove up to Ffald-y-Brenin the Christian Retreat Centre (see footnote for details of book & website *1). This was our 2nd day trip there. The centre has a reputation for powerful encounters with the Lord God. It has been described as “a thin place” where the veil between heaven and earth has been pulled back. Many people have had profound times of worship, & supernatural events have occurred here: healings, words from God, etc. On this lovely sunny day my expectation was running high, although the first time we visited (in August 2010) I didn’t feel anything out of the ordinary – so I was in two minds about what might occur! My wife decided to go for a walk around the local hills. On my way to the little round chapel a lady told me that the staff were all down in the local village at a prayer meeting, “so you’ll have the place to yourself”. I went into the little round chapel with an expectation of a silent, solemn, gentle time of contemplation. I sat on a cushioned ledge that runs round the inside of the chapel. Then a little girl walked in & proceeded to hum a little made up song… continuously for the next 15-20 minutes! She re-arranged the cushions, pulled a bible off a stack & flicked through it. So much for my solemn, quiet contemplation I thought! But then I immediately wondered if God might be using this little girl to “tell” me something. It occurred to me that perhaps God had other ideas. Perhaps I wasn’t there to have what I expected: a quiet, solemn encounter with God. Perhaps he wanted a lively, child-like encounter; full of unexpected fun, music, laughter & carefree action. It occurred to me: Excitement is a holy response. It’s OK to be excited when we meet with God, & to expect adventure! That sounds a LOT better than my solemn expectations, any day! Lots of people fall into the trap of thinking that an encounter with God “should” be solemn, but at Ffald-y-Brenin I encountered a playful, child-like hopefulness that was refreshing & exciting. More of that please! As I thought, I realised that my own child-like enthusiasm is actually a great strength, but I tend to suppress it, especially in the company of other people (God included). But that is wrong. I need to be more like that little girl in the chapel: just making up songs & humming a tune, simply because I can; simply to enjoy life, the world, the creation, & my connection with God. The keywords that came to me were: laughter, expectancy, love, fun, exploration & adventure. Don’t suppress my hope for a better (ie more fun, adventurous, exciting) encounter with God; & life in general. Even if I don’t see (immediate) improvement in a particular aspect of life, DON’T allow my hope for that improvement to be stolen away (by me, or by the enemy, Satan). Look for God in child-like ways. Faith is especially strong when it is child-like: open, honest, automatic, hopeful. It doesn’t occur to children that their parent(s) will do anything bad to them: they just believe. God DOESN’T have a big stick, he has a kind, open hand that welcomes me & beckons me to come closer; to encounter God more often & in deeper ways. This is true for you too! Laugh & have a fun-loving approach to life. Don’t be stuffy. Don’t be “adult” all the time. Don’t suppress my enthusiasm & love for things. Enjoy things. Allow myself to enjoy, explore, have adventures & make discoveries. Don’t change who & what I am (especially my own child-like faith qualities) just so that I fit in with other people & their chosen way of “doing” their own life. The “motto” I came away with is this: Just believe. Have faith. Have fun. I have thought about this motto many times since our trip to Ffald-y-Brenin. It seems to be a motto for many (maybe all) aspects of my life & I’m happy with that! The book “The Grace Outpouring” by Roy Godwin & Dave Roberts, details the awesome manifestations of God’s power in a hilltop Christian retreat centre called Ffald-y-Brenin.